This is my favorite page at the website. 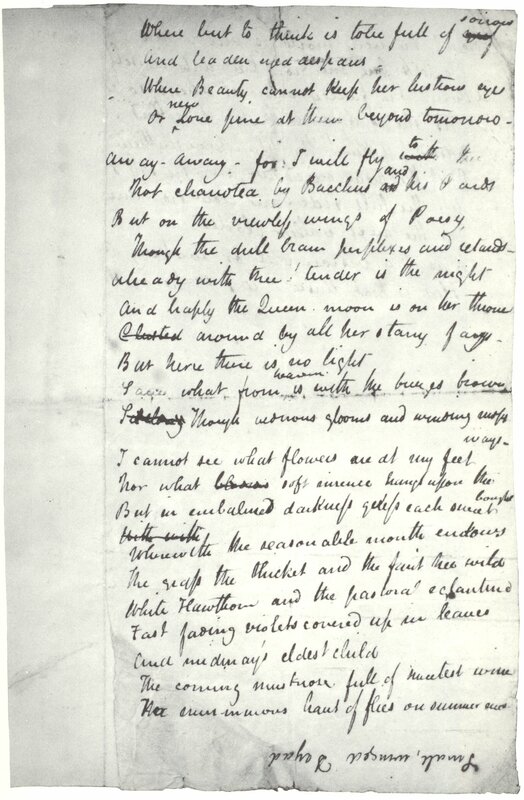 It’s a collection of the original manuscript images of Keats’s poetry and letters. The images are large for reasons of clarity so they may take a few moments to load. ‘What Printing presses yield we think good store. This is the most remarkable manuscript at the site, I think, for it perfectly captures the effort and enthusiasm of Keats at the exact moment of poetic creation. When viewing it, you can almost imagine him lost in concentration in the garden at Wentworth Place. Brown’s account was dismissed as ‘pure delusion’ by Charles Wentworth Dilke, the co-owner of Wentworth Place who visited Brown and Keats regularly. After reading the above account in Milnes’s 1848 biography of Keats, Dilke noted in the margin, ‘We do not usually thrust waste paper behind books’. 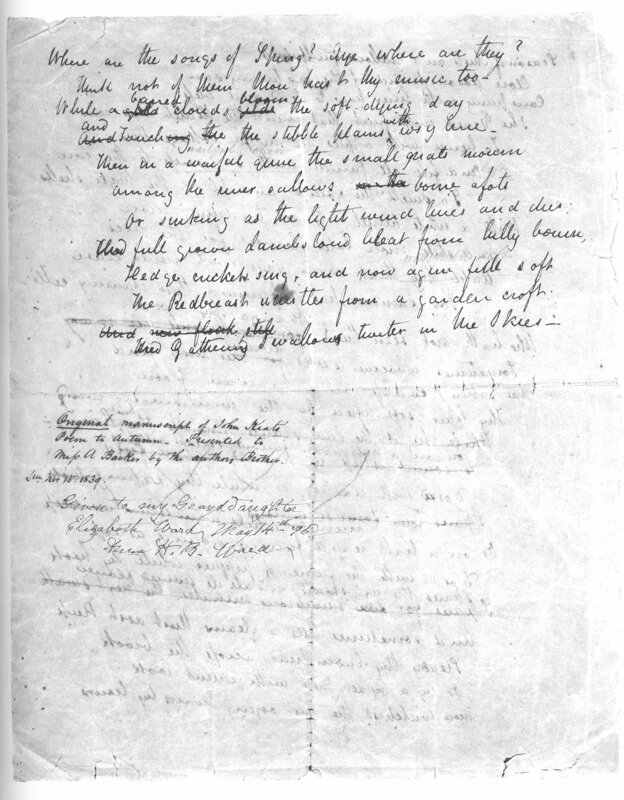 The ‘Nightingale’ manuscript is actually on two sheets of paper, not ‘four or five’ as Brown recalled, and the stanzas are in relative order. But the work was written hastily on scrap paper. It is clear that Keats did not anticipate writing such a lengthy poem when he took just two sheets of paper into the garden, – and he did not dare interrupt his writing to fetch more later. Interestingly, there has been speculation that this isn’t the first draft, but a later copy. However, the presence of ‘Small, winged Dryad’ at the bottom of the second page (upside down) is clearly a false start to the poem. It was abandoned and Keats began the poem again on the other side of the paper. 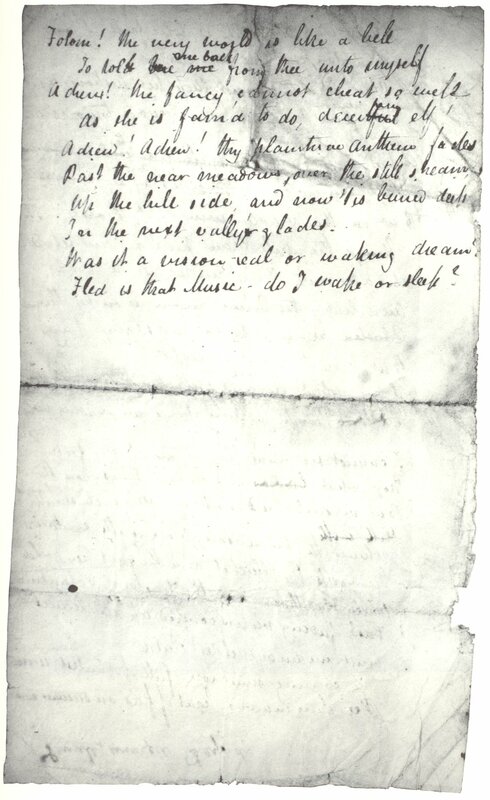 Note that Keats wrote on both sides of the scrap paper. Unfortunately, the manuscript is in poor condition. Certain words have faded or been badly smudged. I can’t complain, however; it was sheer luck that it survived at all. 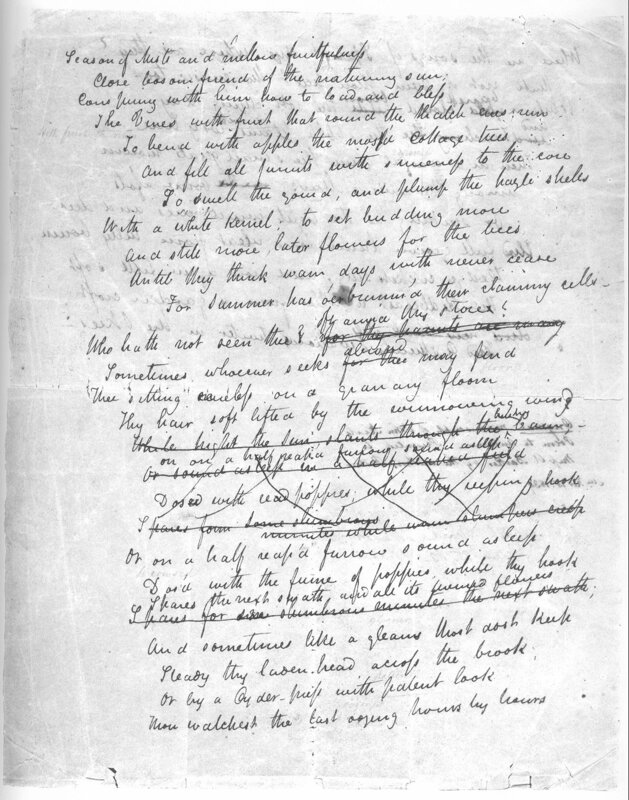 On the second page, ‘grief’ is altered to ‘sorrow’ and Keats has written and crossed out ‘With with’ above ‘Wherewith’. On the bottom of the page, three words – ‘Small, winged Dryad’ – are written upside-down. On the third page, ‘voice’ is altered to ‘song’, ‘the wide’ to ‘magic’ and ‘kuthless (meant to be ‘ruthless’) is crossed out, obviously due to its similiarity to ‘Ruth’, and followed by ‘perilous’. On the fourth page, there are typical Keatsian moments in which his thoughts raced ahead of his pen, and so we find the transposition ‘To told bac me’ (‘To toll me back’) and the misspellings of ‘forlorn’ and ‘word’. The ‘deceitful elf’ is altered to ‘deceiving elf’. ‘Ode to a Nightingale’: This is my original (1999) scan of the first page from a different source. The image is sepia-tinted. It’s also a bit easier to see the writing on both sides. This work is the opening poem of Keats’s first published volume of poems, released in 1817. He had begun it in the summer of 1816 at Hampstead and completed it by the end of the year. It was his first attempt at a lengthy poem, and Leigh Hunt wrote that it ‘was suggested to him [Keats] by a delightful summer-day, as he stood beside the gate that leads from the Battery on Hampstead Heath into a field by Caen Wood.’ Readers will note that the poem contains the story of Endymion; Keats actually referred to this work as ‘Endymion’ before he attempted a lengthier work on the same subject. Interestingly, quite a few fragments of this original manuscript exist. Charles Cowden Clarke cut up the manuscript after Keats’s death and gave away pieces as souvenirs to the poets’ friends and admirers. Oh! What a power hath white simplicity! Were heard of none beside the mournful robbins. I think we can all agree this was a lovely gift for Clarke! 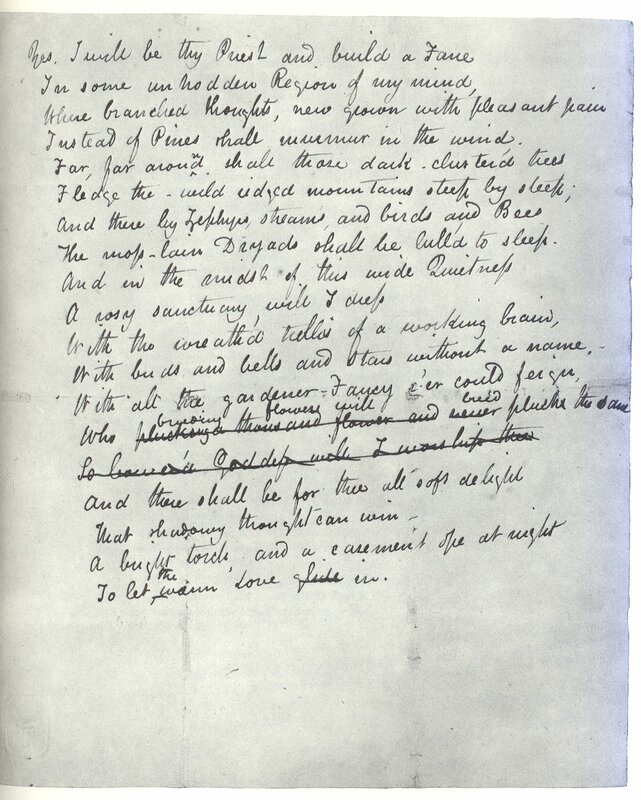 This is an image of the original manuscript of ‘Hyperion’, the poem which so impressed Percy Bysshe Shelley. It was subtitled ‘A Fragment’ and published in Keats’s final volume of 1820. Keats first began this poem in late 1818. In letters to friends, as well as the preface to ‘Endymion’, he alluded to a ‘new Romance’, only to abandon it in April 1820. Why did Keats abandon the work? No one knows, but there are problems with its structure and intent. He did return to the subject a few months later with ‘The Fall of Hyperion’. Keats did not want ‘Hyperion’ to be published, going so far as to insert the following into the 1820 volume: ‘[I]t was printed at [the publisher’s] request, and contrary to the wish of the author.’ But his publisher’s faith was rewarded. ‘Hyperion’ was immediately praised, quite contrary to the usual reception for Keats’s work. Though Keats never completed ‘Hyperion’, it remains one of his most evocative and beautiful works. This letter was written during Keats’s walking holiday in Scotland with Charles Brown. He wrote many such ‘travel letters’ to family and friends. It begins with the travelers at Ballantrae and then continues through Stranraer to Ayshire to Glasgow. ‘I shall endeavour that you may follow our steps in this walk – it would be uninteresting in a Book of Travels – it can not be interesting but by my having gone through.’ So Keats wrote, and the letter does bring the Scottish scenery (and its eccentric inhabitants) to life. 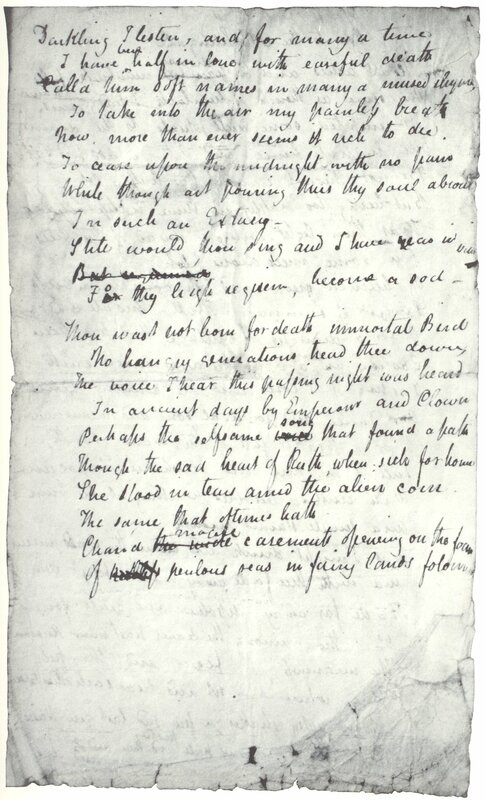 This letter is an example of Keats’s typical ‘running commentary’-style of composition. We are fortunate to read his letters at all, but they are always in a neatly-printed book. I think it’s nice to see the letters, – to see them in the same way his friends and family did when they first arrived in the post. 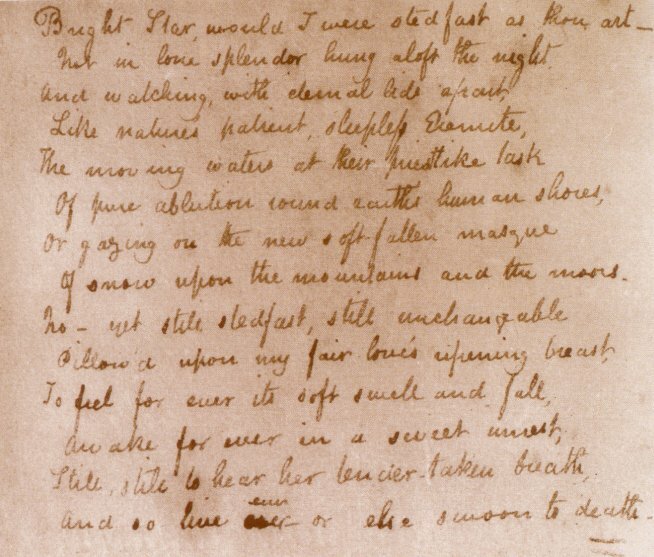 Tom Keats was already dead when Keats wrote this letter to their sister Fanny. Keats wanted to prepare her for the inevitable news; he warns her that Tom is in a ‘very dangerous state’. Tom died of tuberculosis, just as Keats himself would less than three years later. Their mother had perished years earlier from the disease. *Note: This manuscript is in George Keats’s handwriting. Keats’s original manuscript of this famous ode has been lost. The earliest surviving copy / first draft is this one, made by his brother George in January 1820. 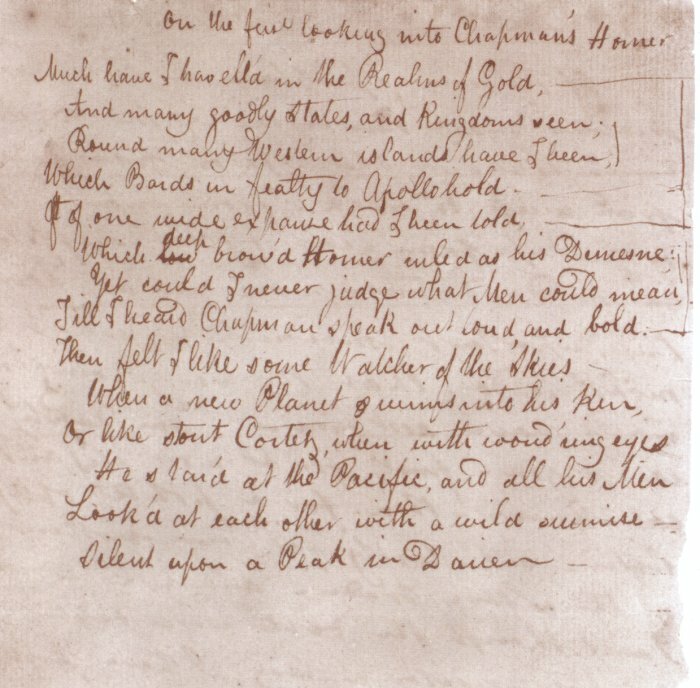 George was visiting England from America and made copies of his brother’s recent work, including the great odes. 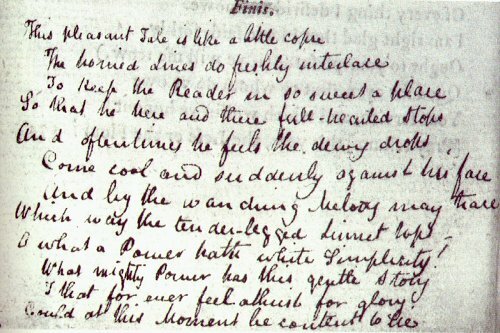 Keats gave George his own working notebook for the task; included were drafts of other works in his own hand, including ‘Isabella’. 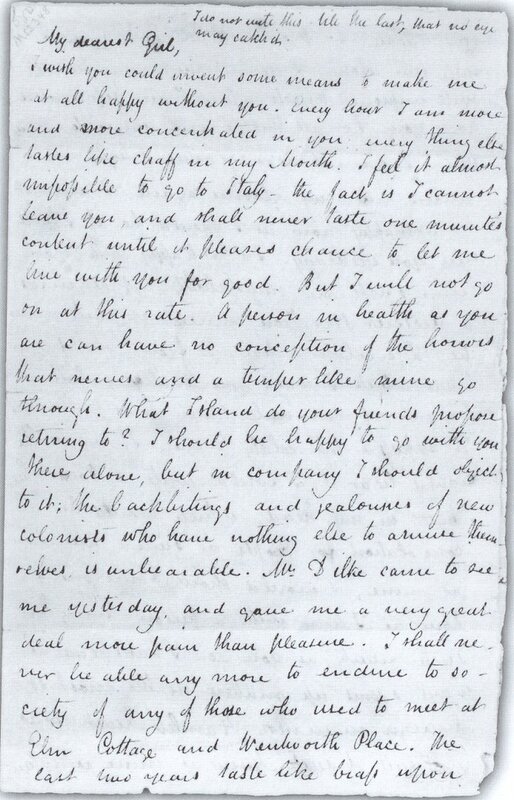 This is the last surviving letter from Keats to Fanny, written while he was staying at Leigh Hunt’s home and one month before he sailed to Italy. This is Keats’s signature, including his nickname ‘Junkets’, from a letter to Leigh Hunt, 10 May 1817. It was Hunt who dubbed Keats ‘Junkets’ due to the poet’s Cockney-esque pronunciation of his name. This famous sonnet was written by Keats in his copy of ‘The Poetical Works of William Shakespeare’ opposite the poem ‘A Lover’s Complaint’. 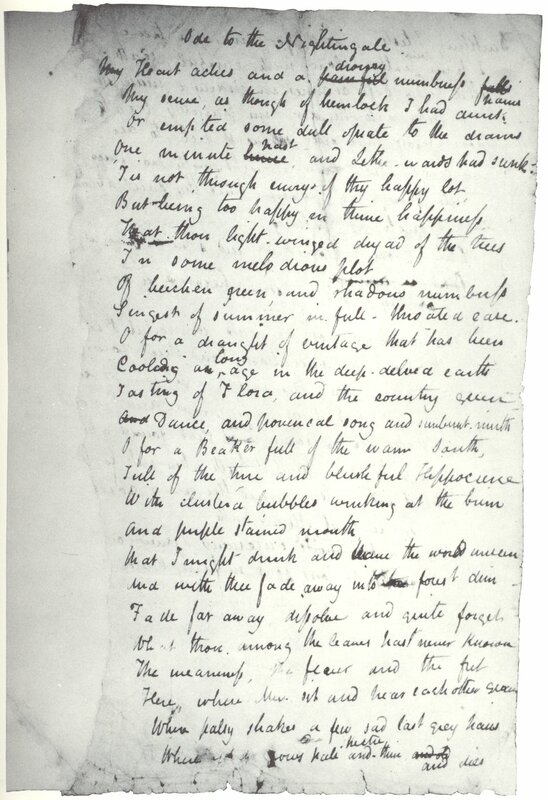 This brief note includes the ‘Great Spirits’ sonnet which Haydon later sent to Wordsworth. This is the beginning of ‘Lamia’, from Keats’s fair copy of the poem. ‘Lamia’ was begun at Winchester in the summer of 1819; Keats set it aside in early September, but completed further revisions in March 1820. During the lull in composition, he wrote the beautiful ode, ‘To Autumn’, and continued work on ‘Otho the Great’, ‘The Fall of Hyperion’, and ‘King Stephen’. Struggling for popular and financial success, Keats was pleased with ‘Lamia’. It marked the first time he returned to a previously abandoned poem. Some notes on the manuscript: This ode was originally begun as a sonnet, which explains its curious structure. (As his letter indicates, he had ‘dashed off’ several sonnets in the third week of April 1819, of which this was the last.) No alteration in the original manuscript occurs until the thirteenth and fourteenth lines. At that point, Keats seems to have decided to alter the structure of the work. 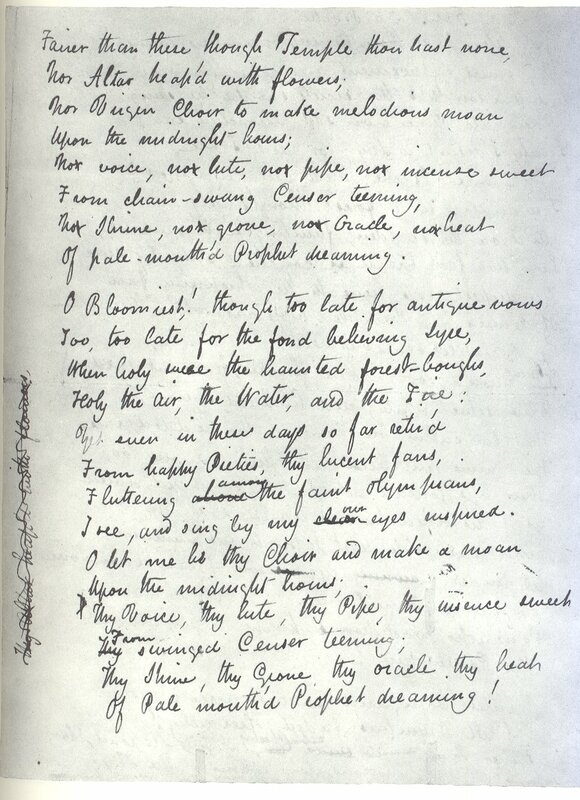 Originally titled ‘To Psyche’, he added ‘Ode’ later; note the different and widely-spaced angle of writing in the manuscript. This decision to change a perfectly acceptable sonnet to an ode is perhaps the real importance of this work. It marks the beginning of a sequence of even greater odes. Keats was terminally ill as his final volume of poetry was prepared. As a result, his publishers made several alterations to the original work without his input. In particular, they were stymied by his use of the words ‘freckle-pink’ and ‘syrian’ in line fourteen. 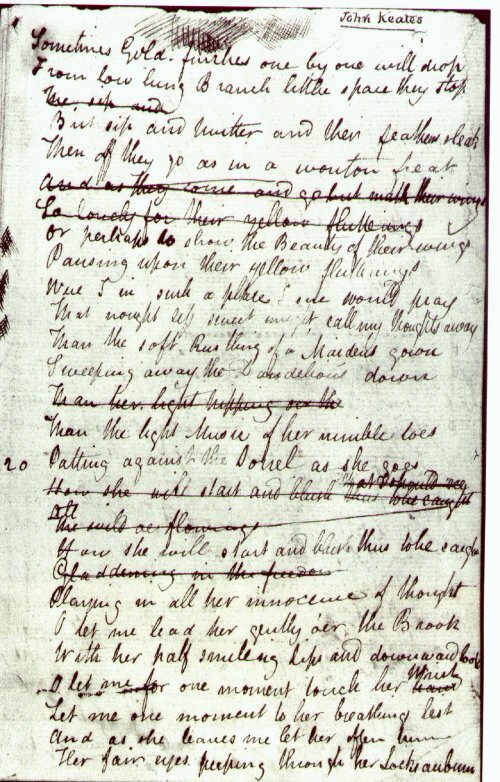 Keats had originally written ‘silver-white’ in the work, but changed it to ‘freckle-pink’ in the margin, and included the latter in the copy he made for George. The publishers retained ‘silver-white’; also, they could not define the obscure ‘syrian’ and so changed it to ‘Tyrian’, which was a traditional purple dye. They also altered the end of line ten, which Keats had ended ‘the whispering fan’. Taylor and Hessey changed it to ‘whisp’ring roof’, which completely ruined Keats’s rhyme scheme. These changes reflected the vicious criticism of Endymion, which had been attacked for a certain quaintness in creating and altering words as well as an exaggeratedly lush style. Understandably, they also looked askance at the beginning of the third stanza and changed Keats’s original ‘O Bloomiest!’ to ‘O brightest!’ – a tepid alteration but probably necessary. The most notable alteration in ‘Ode to Psyche’ was made by Keats himself. The final line originally read ‘To let warm Love glide in’. He altered it to ‘To let the warm Love in’, a simple but lovely change.. This is perhaps Keats’s most famous and beloved work. It is considered the perfect embodiment of poetic form, intent, and effect. ‘To Autumn’ was the last of Keats’s great lyrics. It was more heavily revised than other works. I will post a discussion of the manuscript and its revisions shortly (November 2004.) I wanted to put the images up as soon as possible. 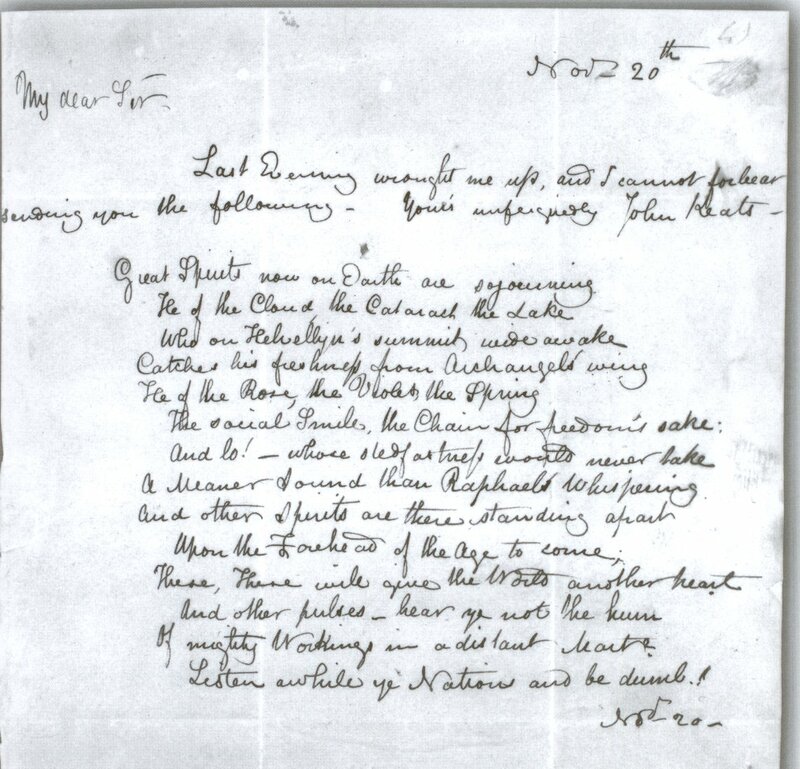 A note on the manuscripts: The largest collection of Keats’s manuscripts (poetry and letters) is held by Harvard University. Arthur Houghton Jr’s bequest of Keats-related material formed the foundation of the library which now bears his name. And, of course, Amy Lowell also bequeathed her collection of Keats memorabilia to Harvard. Sadly, past misuse (and overuse) means that most visitors cannot view the original manuscripts, only facsimile reproductions. The Houghton Library does have a Keats Room, – and it is certainly worth a visit if you’re in the Boston / Cambridge area. 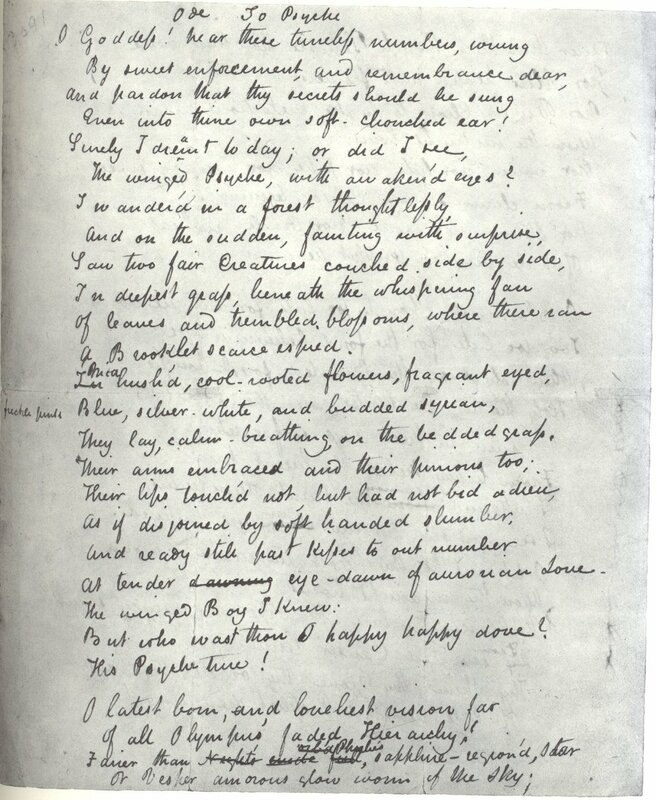 In England, the British Library has some Keats manuscripts (including ‘Hyperion’) while Cambridge University holds the ‘Ode to a Nightingale’ manuscript. Unfortunately, none of my great-great-grandparents had the foresight to purchase an original manuscript in, say, 1901 when ‘Ode to Psyche’ sold for £86. Alas.